Ackling was born in Isleworth, London, and studied at St Martins School of Art in the late 1960s alongside a remarkable group of students that included Richard Long, Bruce Mclean and Gilbert and George. He taught at Chelsea College of Art and served as a Governor of Norwich School of Art and Design. Born in Leeds, Armitage studied at Leeds College of Art 1933–7 and the Slade School of Art in London 1937–9. He served in the army 1939–46. In 1947 he was appointed Head of Sculpture at Bath Academy of Art, a post he held until 1956. He represented Britain at the Venice Biennale in 1958, where he received the David Bright Foundation Award for the Best Sculptor under forty-five. He was awarded a CBE in 1969 and was elected a Senior Member of the Royal Academy in 1994. Mill was born in Somerset and studied languages at Oxford before establishing a prestigious career as a lighting-cameraman in the film industry and as a photography director, working on such films as The Great Rock and Roll Swindle (1978). Since the 1980s he has exhibited his light installations internationally, including the Pier Arts Centre in 2010. He lives and works in London. Wilhelmina Barns-Graham was born in St Andrews and studied painting at Edinburgh College of Art from 1932-37. She became one of the central figures in the St Ives Group, arriving in St Ives in 1940. Since 1960, she divided her time between St Ives and her home. Barns-Graham made several working visits to Orkney in the mid 1980s. She died in St Andrews. Bissier was born in Freiburg-im-Breisgau, Germany, and moved to Hagnau on Lake Constance in 1939. He made ink and wash paintings and designed fabrics but did not exhibit until after the Second World War. His work was represented at Documenta in Kassel in 1959 and 1964, and at the Venice Biennale in 1960. He exhibited at the São Paulo Biennial in 1961, where he was awarded the 10th Anniversary Jubilee Prize. He moved to Ascona, Switzerland, in 1959 and became friends with Jean Arp and Ben Nicholson. Sandra Blow was born in London and studied at St Martin’s School of Art from 1941 to 1946, at the Royal Academy from 1946 to 1947, and subsequently at the Academy of Fine Arts, Rome from 1947 to 1948. She travelled to Spain and France in the late 1940s, worked in Cornwall for a year from 1957 to 1958 and then went on to teach at the Royal College of Art from 1960.She was appointed Honorary Fellow of the Royal College of Art in 1973. From 1994 onwards she lived and worked in Cornwall. Boyce was born in Hamilton and studied at Glasgow School of Art. He is part of a generation of Scottish artists who have gained a national and international reputation for their work. In 2009 he represented Scotland at the Venice Biennale and won the Turner prize in 2011. He lives and works in Glasgow. Broido was born in South Africa and lived there until 1949. After moving to St Ives in 1956 he worked for Patrick Heron as a gardener, and had a studio at his house 1956–8. 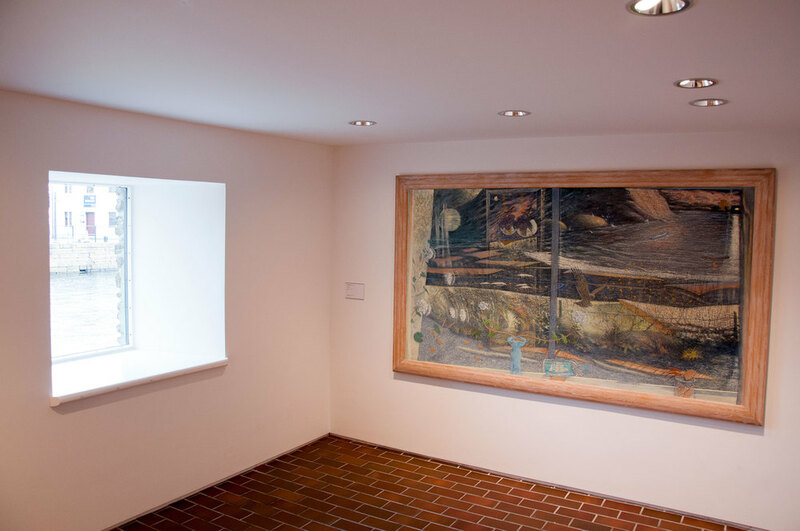 He exhibited regularly with the Penwith Society of Arts, worked as a studio assistant to Barbara Hepworth 1959–62, and taught at Truro Art School 1960–80. In 1980 he moved from Cornwall to London. His work is represented in the collection of Cornwall County Council. Cursiter was born in Kirkwall, Orkney and studied design before attending Edinburgh College of Art in 1906. He joined the army in 1914 and later took charge of a Field Survey Battalion with responsibility to print maps; he was demobilized in 1919 with military honours. Cursiter was appointed Keeper of the National Galleries of Scotland in 1925 and Director in 1930, a post he held until 1948. As Director he created a conservation/restoration department for the galleries and was responsible for the dispersal of the National Galleries collection at the beginning of the Second World War. Following the war he was frustrated in his attempts to set up a gallery of modern and contemporary art in Scotland, however this laid the groundwork for the development of the current Scottish National Gallery of Modern Art in Edinburgh. On his retirement in 1948 he was appointed the Queen’s Painter and Limner and returned to Orkney to paint full-time. He became an Associate of the Royal Scottish Academy in 1927, a full Academician in 1937 and was awarded a C.B.E in 1948. His book Scottish Art at the Close of the Nineteenth Century was published in 1949. He died in Stromness. Davie was born in Grangemouth, Scotland, and studied at Edinburgh College of Art 1937–40. Following service in the army 1941–6 he undertook a travelling scholarship to Italy, where he was impressed by the work of Jackson Pollock and other American Abstract Expressionists in the Peggy Guggenheim collection, Venice. Davie taught at the Central School of Arts and Crafts in London 1953–6; there he became interested in art from Africa and the Pacific. He received the Guggenheim Painting Award in 1956 and the International Painting Prize at the São Paulo Biennial in 1963. He was awarded a CBE in 1972 and was an Honorary Member of the Royal Scottish Academy. Born in Abinger, Surrey, Denny studied in London at St Martins School of Art 1951–4 and at the Royal College of Art 1954–7. He taught at Hammersmith School of Art 1957–9 and was a Visiting Lecturer at Bath Academy of Art 1959–65 and the Slade School of Art in London 1965–71. He was an adviser to the Arts Council of Great Britain and the Institute of Contemporary Arts. Katy Dove was born in Oxford and studied at Duncan of Jordanstone College of Art, Dundee. Her work has exhibited internationally including the Venice Biennale in 2003, when she was selected to participate in Zenomap, the first Scottish representation at the international arts festival. Her film, along with a selection of work by other participating Scottish artists was displayed at the Pier Arts Centre in 2004. Eliasson was born in Copenhagen, Denmark and studied at the Royal Danish Academy of Fine Arts in Copenhagen 1989-95. In 2003 he represented Denmark at the Venice Biennale and exhibited The Weather Project at Tate Modern, London. ‘Take your time’, a survey exhibition organised by San Francisco Museum of Modern Art in 2007 travelled to The Museum of Modern Art and P.S.1 Contemporary Art Center, New York, in 2008. Eliasson lives and works in Berlin and Copenhagen. Born in Nassau, Bahamas, to Scottish parents, Finlay was educated at Dollar Academy in Clackmannanshire. In the mid-1950s he came to Orkney to live in Rousay, describing the island as his birthplace as a poet. He is known through his work as a poet, visual artist, philosopher and gardener. His garden, Little Sparta, at Stoneypath in South Lanarkshire contains many of his artworks and is considered to be his masterwork. He was nominated for the Turner Prize in 1985 and received Honorary Doctorates from Aberdeen University (1987), Heriot Watt University in Edinburgh (1993) and the University of Glasgow (2001), and an Honorary Professorship from the University of Dundee (1999). He was awarded a CBE in 2002. Born in Sheffield, Yorkshire, Foxcroft studied at the Camberwell School of Art and Crafts in London 1970–74. She is known principally for her three-dimensional works but has also produced print editions in collaboration with Cairn Gallery in Nailsworth, England, and the October Foundation in Eindhoven, The Netherlands. She lives and works in Hertfordshire. Francis was born in Newtownards, County Down, Northern Ireland. He studied in London at St Martins School of Art 1980–85 and Chelsea School of Art 1985–6. He lives and works in London. Frost was born in Leamington Spa, England. He served in the Commandos and was taken a prisoner of war in Crete. During this time(1941-5) he began painting, and following the war studied at St Ives School of Painting and at Camberwell School of Art in London 1946–9. 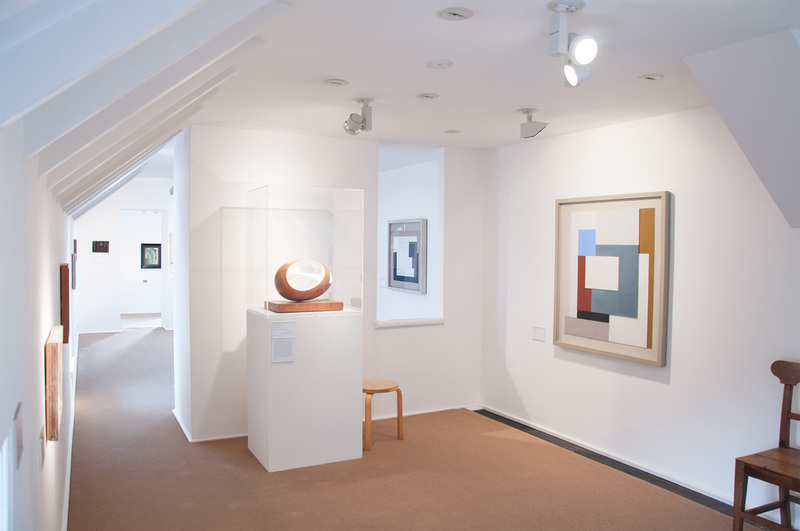 He returned to St Ives in 1950, renting a studio next door to Ben Nicholson and working as a studio assistant to Barbara Hepworth in 1951. He taught at Bath Academy of Art 1952–4. He was the Gregory Fellow at Leeds University 1954–6 and moved to Banbury in 1963, teaching part-time at Coventry School of Art. In 1965 he took up a teaching post at Reading University and was made Professor of Fine Art. He returned to work in Newlyn, Cornwall, in 1974. Frost was elected a Senior Member of the Royal Academy in 1992 and received a Knighthood in 1998. Naum Gabo was born Naum Pevsner in Bryansk, Russia. He studied medicine, engineering, philosophy and art history in Munich, and there met the Abstract Expressionist artist Wassily Kandinsky. In 1914 he moved to Paris with his brother, the artist Antoine Pevsner, then travelled to Norway after the outbreak of the First World War. He returned to Russia in 1917 during the Revolution and in 1920, in collaboration with his brother, wrote the Realist Manifesto. He lived in Berlin 1922–32 and was in contact with the artists of the Bauhaus and the de Stijl group. He returned to Paris in 1932 and became a member of the group Abstraction-Création. In 1935 he moved to England and in 1936 exhibited in ‘Abstract and Concrete’, a group show in Oxford with, among others, Ben Nicholson and Barbara Hepworth. In 1939, at the outbreak of war, he moved to Cornwall. He emigrated to the USA in 1946. He was created Honorary Knight Commander of the Order of the British Empire in 1971. Margaret Gardiner was the founder of the Pier Arts Centre. 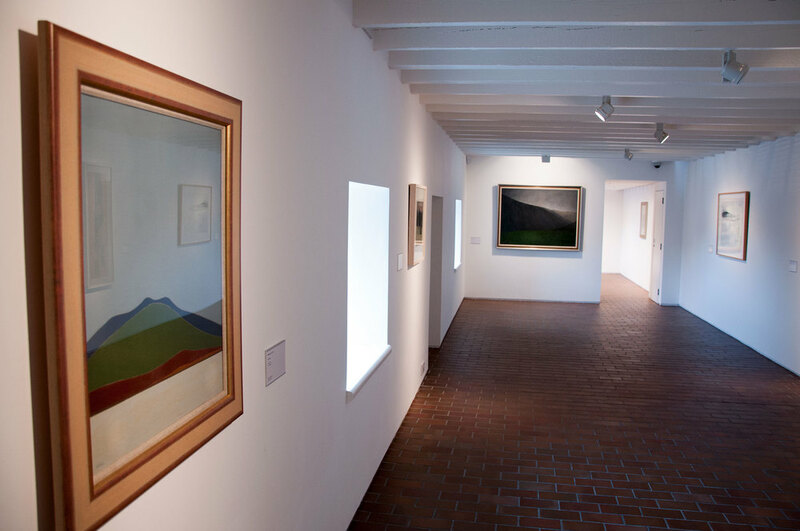 The gallery opened on the 14 July 1979 as the ‘home’ for her generous gift to Orkney of her collection of 20th century British Modernist Art. She was born in Berlin. Her father was the eminent Egyptologist Sir Alan Gardiner. She was educated at the Fröbel School and Bedales before reading, firstly, Modern Languages and then Moral Sciences at Newnham College, Cambridge. 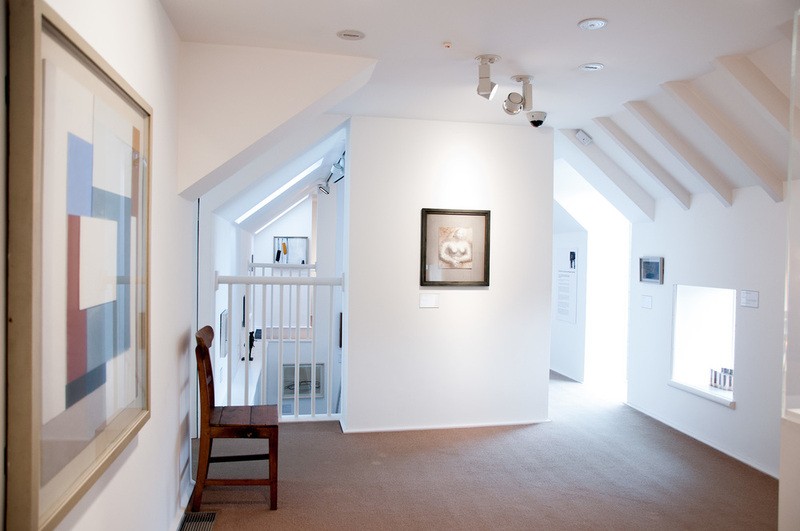 She was a writer and political activist as well as an active supporter and friend of the artists who had gravitated to St Ives during the WWII period. Her interest in modernist art developed through her close friendship with Barbara Hepworth whom she met in London in the 1930s. Her own experiments in painting were encouraged by her artist friends, including Roger Hilton who supplied her with a set of ‘rules for painting’. She first visited Orkney in the 1950s with her son Martin Bernal and continued to visit regularly, maintaining a cottage on Rousay. She died in London. Born in Methil, Fife, Scotland, Gear studied Fine Art at Edinburgh College of Art 1932–6 and Art History at Edinburgh University in 1937. On a travelling scholarship he worked under Fernand Léger in Paris. After serving in the Signals Corps during the Second World War, he lived in Paris 1947–50 and there met the artists Pierre Soulages and Serge Poliakoff. While on the Continent he exhibited with the CoBrA group in Amsterdam as the only UK member. Gear was Curator of the Towner Art Gallery in Eastbourne 1958–64, Head of Fine Art at Birmingham College of Art 1964–75, and was made a Senior Royal Academician in 1995. He died in Birmingham. Born in Edinburgh, Gillanders studied at the University of Edinburgh 1970–74 and taught history at the Royal High School in Edinburgh before forging a career as a freelance advertising and fashion photographer. Since 1983 he has taught photography at Napier University, Edinburgh and has established a reputation for portrait photography. Gillanders worked with Ian Hamilton Finlay on many commissions and produced a book, Little Sparta, photographs of Finlay’s internationally acclaimed garden, published by the National Galleries of Scotland in 1998. He continues to live and work in Edinburgh. Gordon was born in Glasgow and studied at Glasgow School of Art 1984–8 and the Slade School of Art in London 1988–90. He was awarded the Turner Prize in 1996 and a major retrospective of his work was held at the National Galleries of Scotland in 2006. He lives and works in New York. another unsent letter. then another. and another. and yet another. Hepworth was born in Wakefield, Yorkshire, and studied at Leeds School of Art 1919–20 and the Royal College of Art in London 1921–4. She lived in Italy 1924–6 and there met her first husband, the sculptor John Skeaping. Along with Skeaping and Henry Moore she adopted, and was an early pioneer of, direct carving techniques. She met her second husband, Ben Nicholson, in 1930 and the couple moved to Carbis Bay, Cornwall, in 1939. 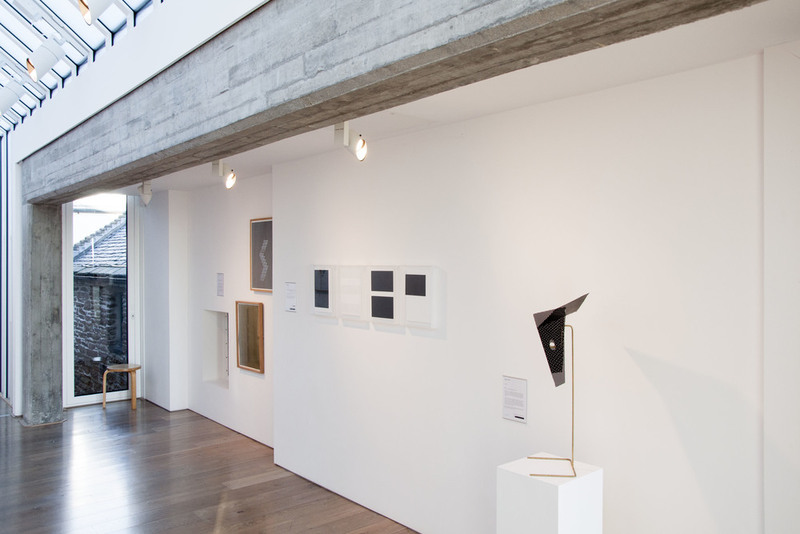 Hepworth became a member of the groups Abstraction-Création and Unit One in 1933. She moved to Trewyn Studio, St Ives, in 1949. In 1950 the Arts Council of Great Britain commissioned two works for the Festival of Britain. In the same year a retrospective of her work was presented at the Venice Biennale. Hepworth was awarded a CBE in 1958 and a DBE in 1965. In 1963 she was awarded a major commission for the Dag Hammarskjöld Memorial at the office of the United Nations, New York. Heron was born in Leeds and studied at the Slade School of Art in London 1937–9. He met Ben Nicholson, Naum Gabo and Barbara Hepworth while working at the Leach Pottery 1944–5. He taught at the Central School of Arts and Crafts in London, and was art critic of the New Statesman and Nation 1947–50 and London correspondent of Arts (New York) 1955–8. His many critical writings include The Changing Forms of Art (1955). He was awarded a silver medal at the São Paulo Biennial in 1965 and a CBE in 1977. In 1956 he moved to Eagles Nest, Zennor, Cornwall where he continued to work until his death. Born in Northwood, Middlesex, Hilton studied at the Slade School of Art in London 1929–31, and then under Roger Bissière at the Académie Ranson in Paris 1931–9. He served in the army during the Second World War and was held a prisoner of war 1942–5. He painted his first abstract work in 1950; and in 1953 he travelled to Amsterdam and Paris with Dutch painter Constant and saw works by Mondrian. He taught at the Central School of Arts and Crafts in London 1954–6 and in 1964 was awarded the UNESCO Prize for Painting at the Venice Biennale. Hilton rented a studio in Newlyn, Cornwall, 1957-60 and moved to Bottallack, Cornwall, in 1965. He was awarded a CBE in 1968. Callum Innes was born in Edinburgh and studied at Gray’s School of Art in Aberdeen 1980–84 and Edinburgh College of Art 1984–5. He was shortlisted for the Turner Prize in 1995 and went on to win the Natwest Art Prize in 1998 and the Jerwood Painting Prize in 2002. In 2003 he was awarded an Honorary Doctorate from Aberdeen University and in 2004 was elected an Associate Member of the Royal Scottish Academy. He lives and works in Edinburgh. Born in Edinburgh, Johnston studied at Edinburgh College of Art where he went on to hold the position of Professor of Art. He ran the interdisciplinary postgraduate course ‘Art, Space and Nature’ and is a member of the research project ‘Nozomi’, a joint venture between the College of Art and partners in Japan he co-edited Patrick Geddes: By Leaves We Live, published by Yamaguchi Institute of Contemporary Arts, 2005. He has worked on a number of commissions in partnership with Edinburgh based architects Reiach and Hall and he collaborated with the Japanese Architect Shinichi Ogawa for the 2002 Gwangju Biennale in Korea. He lives and works in Edinburgh. Kapoor was born in Bombay (Mumbai), India, and moved to London in the early 1970s. He studied at the Hornsey College of Art 1973–7 and Chelsea School of Art 1977–8. He represented Britain in the 1990 Venice Biennale where he was awarded the Premio Duemila Prize, and in 1991 he won the Turner Prize. Kapoor is a Royal Academician and was awarded an Honorary Fellowship of the London Institute in 1997 and a CBE in 2003. He lives and works in London. Lambie was born in Glasgow and studied at Glasgow School of Art. He represented Scotland at Zenomap the first Scottish pavilion at the Venice Biennale in 2003 and was nominated for the Turner Prize in 2005. He is based in Glasgow and in New York. Lanyon was born in St Ives, Cornwall. He studied at the Penzance School of Art in 1937 and met the artist and writer Adrian Stokes who advised him to study at the Euston Road School in London, which he did briefly in 1938. In 1939 he met Ben Nicholson, Barbara Hepworth and Naum Gabo and received painting lessons from Nicholson. Returning to Cornwall from wartime service in the RAF he became a founding member of the Penwith Society of Arts. He taught at the Bath Academy of Art 1950–7 and ran an art school at St Peter’s Loft, St Ives, with Terry Frost 1957–60. He died in a gliding accident in Somerset. Low was born in Gourock, Scotland. In 1942 she entered Glasgow School of Art where she studied alongside Ian Hamilton Finlay. She then attended Jordanhill Teacher Training College in Glasgow and later worked as an art therapist. In 1963 she co-founded, with John Taylor and Cyril Gerber, the influential New Charing Cross Gallery in Glasgow which was succeeded by the Compass Gallery in 1969. During the 1960s and 1970s she made successive visits to Orkney to paint. She was elected a Royal Scottish Academician and in 1999 was awarded an Honorary Degree of Doctor of Letters from Glasgow University. She died in Glasgow. Born in Oslo, Norway, Løw studied at the Glasgow School of Art 1998–2001 and was awarded the Statoil Grant Prize for Contemporary Art in Norway in 2005. She lives and works in Oslo. MacIver was born and raised in Orkney, attending Kirkwall Grammar School, before completing undergraduate study at Gray’s School of Art in Aberdeen. He studied for his Master’s Degree at the Slade School of Art in London and then spent two years at the British School at Rome as the successful recipient of the Sainsbury Scholarship in Drawing and Painting. Since 2006 he has maintained a successful career as a painter continuing to receive awards and recognition for his work. He lives and works in Abingdon. Frederick Edward McWilliam was born in Banbridge, County Down, Northern Ireland and studied painting at Belfast School of Art and at the Slade School of Art in London 1928–31. He served in the RAF in India 1940–45 and returned to teach in London at the Chelsea School of Art and the Slade School of Art. McWilliam was a contributing artist to the Festival of Britain in 1951 and was a prizewinner at the John Moores Exhibition in Liverpool in 1961. He was awarded a CBE in 1966 and elected a Senior Royal Academician in 1989. Mellis was born in China to Scottish parents. She attended Edinburgh College of Art 1929–33 where she studied under S. J. Peploe and worked alongside fellow students William Gear and Wilhelmina Barns-Graham. She married Adrian Stokes in 1938 and lived in Carbis Bay, Cornwall, 1939–46. 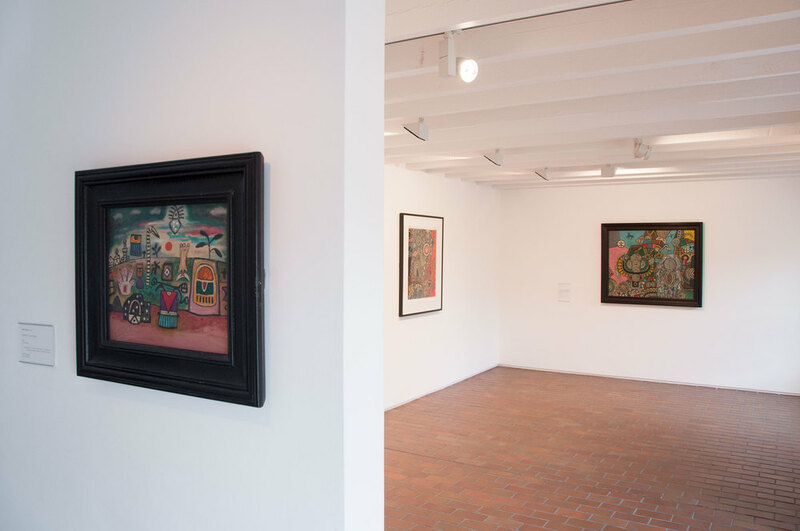 During the Second World War Mellis met many of the artists who had moved to St Ives from London including Hepworth, Nicholson and Gabo, and began making constructions around this time. She lived in France 1948–50 before moving back to live and work in Southwold, Suffolk. Miller was born in Bristol, England. He has worked with camera-less photography techniques since the mid 1980s after establishing his reputation as a landscape photographer. He lives and works in Dartmoor. Newcomb was born at Harrow-on-the-Hill. She studied general sciences at Reading University and taught maths and science at Bath High School. With her husband Godfrey, she farmed and ran a small pottery, before pursuing her career as a painter. Her work was championed by the London art dealer Andras Calman and she had numerous exhibitions at the Crane Kalman gallery. Her work is represented in theTate. She exhibited at the Pier Arts Centre in 1995 and made several subsequent visits to Orkney. She died in Suffolk. Ben Nicholson was born in Buckinghamshire, the eldest son of the painter William Nicholson. In 1920 he married fellow artist Winifred Roberts and lived in Cumberland, Switzerland and London during the 1920s and 1930s. In 1930 he met Barbara Hepworth whom he subsequently married. Nicholson and Hepworth moved to Cornwall in 1939. Increasingly he spent time away from Cornwall until he moved to the Ticino, Switzerland in 1958. International recognition during the 1950s included the first Guggenheim International Painting Prize in 1956 and the International Prize for Painting at the 1957 São Paulo Biennial. He received the British Order of Merit in 1968. He returned to Britain in 1971 and died in London. 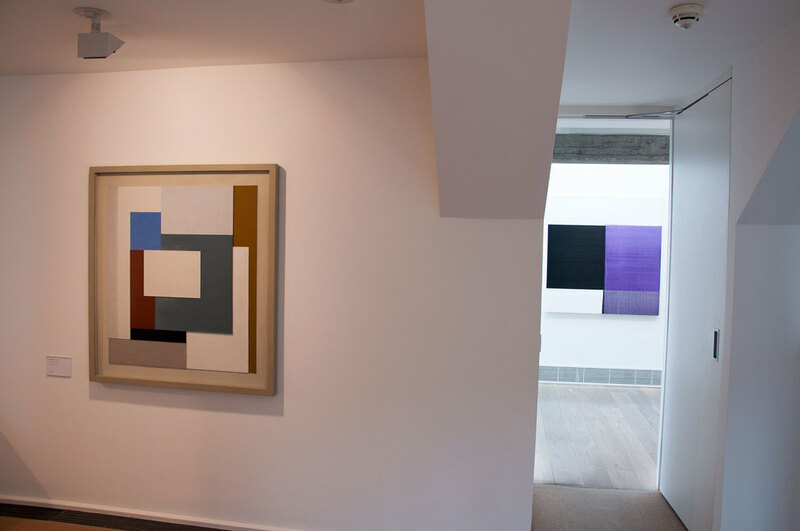 Simon Nicholson was born in London, one of triplets from the marriage of Ben Nicholson and Barbara Hepworth. He moved with his family to Carbis Bay, Cornwall in 1939 and studied at the Royal College of Art in London 1953–4 before studying archaeology and anthropology at Trinity College, Cambridge, 1954–7. In 1964 he became Visiting Professor in Sculpture at Moore University, Philadelphia, and was Professor of Sculpture at the University of California 1965–71. He devised and managed an innovative arts course for the Open University in 1971 entitled ‘Art and the Environment’. His work was included in the exhibition ‘St Ives: Twenty-five Years of Painting, Sculpture and Ceramics’ at the Tate Gallery, London in 1985. He died in Oxford. Paolozzi was born in Leith, Edinburgh and studied at Edinburgh College of Art 1943–7 and the Slade School of Art in London 1947–9. During the 1950s he taught in London at the Central School of Arts and Crafts and St Martins School of Art. A member of the Independent Group in London, he was commissioned to make a work for the Festival of Britain in 1951. Throughout the 1960s and 1970s he was a pioneering figure in British sculpture and printmaking, representing Britain at the Venice Biennale in 1960 where he won the David Bright Foundation Award for the Best Sculptor under forty-five. Paolozzi undertook a number of high-profile public commissions throughout his career, most prominently a mosaic for Tottenham Court Road Underground station in London. He was elected a Royal Academician in 1979, became an Honorary Member of the Royal Scottish Academy and was knighted in 1989. He died in London. Poliakoff was born in Moscow. He left Russia in 1919 and lived in Constantinople, Sofia, Belgrade, Vienna and Berlin before settling in Paris in 1923 where he studied painting while supporting himself as a musician. He moved to London in 1935 and studied at the Slade School of Art before returning to Paris in 1937. He made his first abstractions in 1938 after meeting Kandinsky and Robert and Sonia Delaunay. In 1945 he had his first one-man exhibition at the Galerie L’Esquisse, Paris and exhibited in the 1962 Venice Biennale. In 1965 he was awarded the International Prize at the Tokyo Biennial. Poliakoff became a French national in 1962 and died in Paris. Born in Newmarket, Suffolk, Reynolds served in the British army during the Second World War. While posted in Hanover, Germany, he saw the work of Paul Klee and the German Expressionists of Der Blaue Reiter. Following the end of the war he studied at Woolwich Polytechnic 1948–52 and at the Royal College of Art in London 1952–53. He rose to prominence as a landscape painter, exhibiting with the London Group in 1950, before developing a purely abstract style. He taught in London at the Central School of Arts and Crafts 1954–61 and, from 1962, at St Martin’s School of Art. Róbertsdóttir was born in Reykjavík, Iceland, and studied at the Icelandic College of Arts and Crafts 1963–70 and the Konstfack Art School in Stockholm, Sweden, 1970–71. She lives and works in Reykjavík. Rothschild was born in Dublin. She studied at the University of Ulster, Belfast and at Goldsmiths’ College, London. She has exhibited widely, including the monumental ‘Cold Corners’ in the Duveen Galleries of Tate Britain in 2009 and the inaugural exhibition at The Hepworth Wakefield in 2011. She lives and works in London. Born in North Ronaldsay, Orkney, Scott trained at Gray's School of Art in Aberdeen, graduating in 1962. In 1970 his bronze sculpture of a lifeboat man looking out to sea was unveiled by the Queen to commemorate the Longhope lifeboat disaster of 1969. He lives and works in North Ronaldsay. Born in Greenock, Scotland Scott lived and studied in Belfast 1928–31 and then moved to London to attend the Royal Academy Schools. He ran a painting school in Pont-Aven 1937–9 and served in the Royal Engineers during the Second World War. He was senior painting master at Bath Academy of Art 1946–56 and won first prize at the second John Moores Exhibition in 1959. He was awarded a CBE in 1966 and was elected a member of the Royal Academy in 1984. Born in Dublin, Ireland, Scully moved to England in 1949. He studied at Croydon College of Art 1965–68, the University of Newcastle-upon-Tyne 1968–72, and Harvard University in the USA 1972–73. He taught in London at Chelsea School of Art and Goldsmiths College 1973–5. In 1975 he was awarded a Harkness Fellowship and settled in New York, gaining American citizenship in 1983. Scully was nominated for the Turner Prize in 1989 and in 1993. He lives and works in America. Sinclair was born in Glasgow. He studied at Glasgow School of Art 1984–92 and is currently Academic Researcher and Lecturer in Glasgow School of Art’s Department of Sculpture and Environmental Art. He lives and works in Kilcreggan, Scotland. Margaret Tait was born in Kirkwall, Orkney. She studied medicine at Edinburgh University 1936–41 before joining the Royal Army Medical Corps in 1941. She studied at the Università Italiana per Stranieri in Perugia, Italy in 1950 and went on to study film at the Centro Sperimentale di Cinematografia in Rome 1950–52. She founded Ancona Films with Peter Hollander in Rome in 1953. In the 1960s Tait moved from Edinburgh to Orkney where she made a series of films and wrote poems and short stories. Retrospectives of her work were held at the Edinburgh International Film Festival 1970 and 2004 and at the National Film Theatre in London 2000. She died in Kirkwall. Born in Milan, Valenti studied at the Brera Academy 1932–7. His early works were highly colourful narrative paintings based upon dreams and childhood memories. He was an active member of the Corrente movement and was a friend of Ben Nicholson and Julius Bissier. His works of the 1950s became increasingly abstract and from 1959 onwards he concentrated on making collage. He died in Switzerland. Vaughan, born in Sussex, gave up a career in advertising to become a painter. He served in the Pioneer Corps during the Second World War, and his drawings of army life first attracted critical attention. He taught in London at the Camberwell School of Art 1946–8, and Central School of Arts and Crafts 1948–57 and was visiting Lecturer at the Slade School of Art 1959–77. Extensive travels through the Mediterranean, North Africa and the USA formed the basis of his writings and journals. He was awarded a CBE in 1969. Wallis was born in Plymouth and from the 1870s worked as a mariner aboard fishing boats. After moving to St Ives in 1890 he ran a marine scrap business, retiring in 1912. He began painting after the death of his wife in 1922; in 1928 he met Ben Nicholson and Christopher Wood, who started to collect his work, bringing it to wider public and critical attention. Some of his paintings were shown by Nicholson in the 7 & 5 Society exhibition held in 1929. He died in the Madron Institute in Cornwall. Wells was born in London and worked as a doctor on the Isles of Scilly 1936–45. He studied art informally, attending evening classes at St Martins School of Art in London 1927–8 and, briefly, the Stanhope Forbes Newlyn School of Painting. Following the Second World War he moved to Newlyn, Cornwall and was a founding member of the Crypt Group (so called because they exhibited in the crypt of the Mariners Church in St Ives) and the Penwith Society of Arts. He died in Newlyn. Wishart was born in Stromness, Orkney. She studied drawing and painting at Gray’s School of Art in Aberdeen and lectured there in the Painting and Drawing department 1969–87. On her retirement she moved back to live and paint full-time in Orkney. She was a close friend of Margaret Gardiner and a founding Trustee of the Pier Arts Centre. She encouraged Gardiner to house her collection in an arts centre that would also house temporary exhibitions and events. She was elected a member of the Royal Scottish Academy in 2005. She died in Kirkwall.